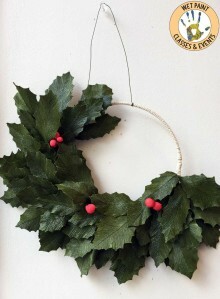 In this class you will learn how to make a holiday wreath using crepe paper, wire, and glue. Discover how to use the existing grain of the paper and decoupage glue to make life-like holly leaves that can be arranged into small wreath to decorate for the holiday season. You’ll also learn how to make berries to add to the wreath for a great pop of color. This class is suitable for beginner flower makers but may offer new techniques and insights for intermediate paper flower artists.